The Interior Ministry has placed members of the Turkish folk music band, Grop Yorum in the list of wanted terrorists. Ali Aracı and İbrahim Gökçek, and Selma and İnan Altun were added to the ministry’s grey-coloured list prepared for people sought for their alleged terror activities. 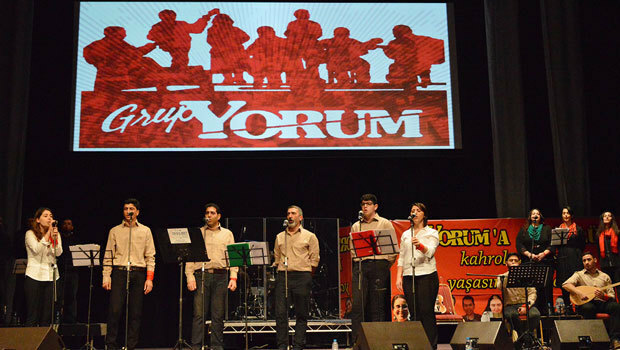 Grup Yorum members, thought to be in exile in Europe, are accused of membership to the outlawed, far-left Revolutionary People’s Liberation Party/Front (DHKP/C). The ministry has 5 categories to publicize the identities of the people it sees affiliated with alleged terror groups: red, green, blue, orange and grey lists. Anyone who help police locate “the grey-list terrorists” is promised TL 300,000 [$80,000] each.